Elegant very limited edition aquamarine blue crystal ladies earrings which have been handmade with octagon shaped 12mm Swarovski Crystals from the Swarovski Elements range. These beautifully shaped Crystals have a wonderful sparkly aqua blue, just like the sea. 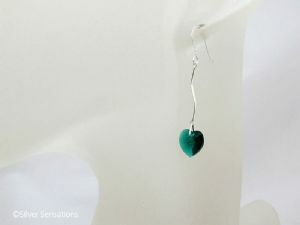 Hanging from solid Sterling Silver curved bars & high quality ear wires they have a drop of just over 66mm (just over 2.5"). 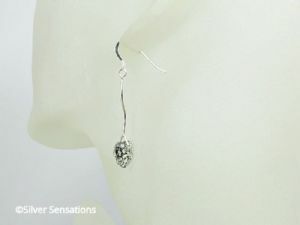 A stunning pair of uniquely designed ladies long Sterling Silver earrings. I buy all of my guaranteed genuine .925 Sterling Silver from reputable UK Silversmiths. This is so I can be sure that only the highest quality materials go in to making your piece of uniquely designed handmade jewellery.